During intrathymic T-cell development, differentiating thymocytes migrate through distinct thymic compartments, interacting with the cortical and medullary microenvironments of the thymic lobules. This migration is mainly regulated by adhesion molecules (including extracellular matrix ligands and receptors) as well as soluble factors such as chemokines, which are also crucial for thymocyte differentiation. The migration events orchestrated by these molecules comprise the entry of bone marrow derived lymphoid progenitors, the migration within the thymus and the emigration of mature thymocytes. Importantly, migration of developing T cells can also impact the positive and negative selection processes, which are essential for avoiding the generation of autoreactive T cells. 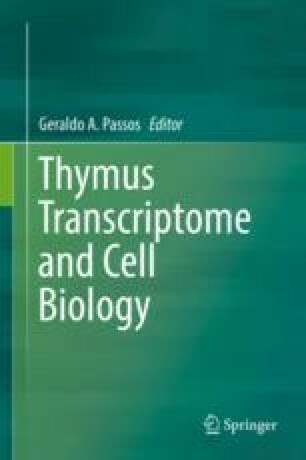 In this chapter we will focus on key molecules involved in thymocyte migration and how their expression pattern can possibly impact T-cell development and repertoire formation. Experiments developed in the context of the work presented in this chapter were funded with grants by The Oswaldo Cruz Foundation (Fiocruz), The National Institute of Science and Technology on Neuroimmunomodulation (INCT-NIM, CNPq), Capes, Faperj (Brazil) and FOCEM (Mercosur).